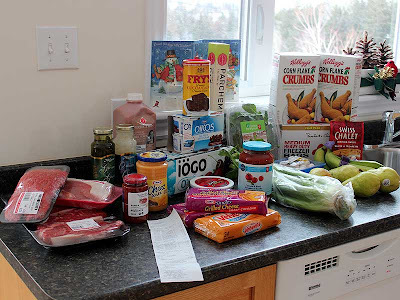 The Witch's Island: Last Groceries For The Year. 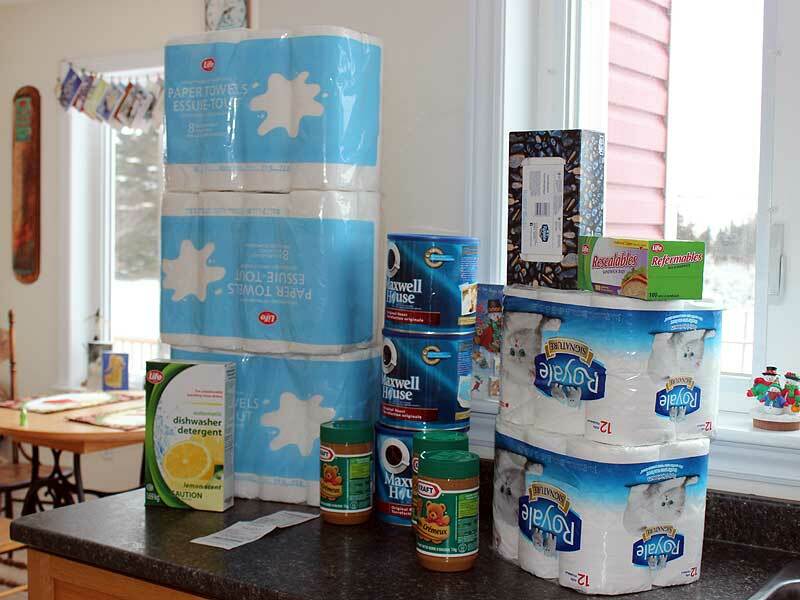 Well, this week we did our last shopping for the year. For a change, I was able to go with Hubby who usually does it by himself after work. Shopping is just another chore for him but because I only go while I'm on holiday I always look forward to it. I love to go and read all the labels and squeeze all the fruit; Hubby just fumes and tries to get it over with as quick as possible! This week Shopper's Drug Mart had great sales on coffee, peanut butter, paper towels and toilet paper. 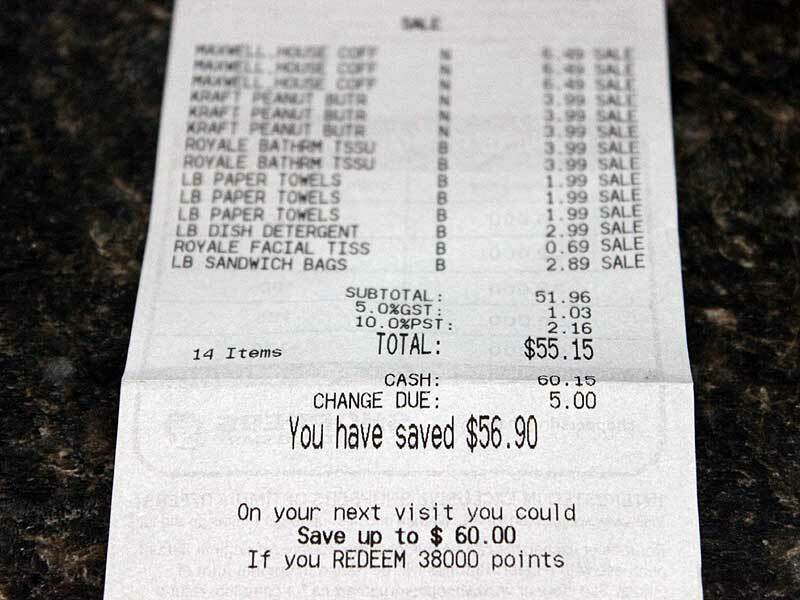 I saved $56.90 on just 14 items! As an added bonus they were having one of their 20X Optimum point promotions and now I am only a few points shy of saving another $60.00. It still feels weird though to be doing this kind of shopping in a drug store. We were shopping in the Big City this week, and because it is cold outside, we were able to get to our favourite fish mart. They close so early on the weekend that we are usually not finished with our day by that timeand you really don't want to have a bag of fish sitting in a hot car for hours so we come home fishless. This week Hubby bought six pieces of salmon side fillet (enough for three meals) for about $24.00. I'm looking forward to a salmon dinner later in the week. The rest of the shopping. 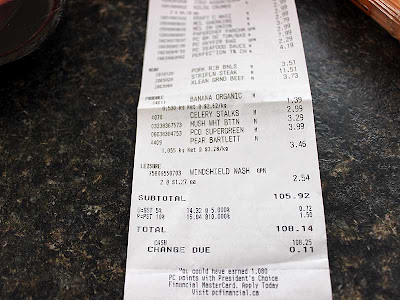 The rest of the shopping was done at the regular old grocery store and while the bill was over $108.00 it did include some expensive items like freezer bags, parchment paper, cocoa powder and corn flake crumbs. Nothing much was really on sale except for the cheese slices and the steak (4 striploins for $11.50). I'm all set now for a good start going into January. It's time to use up the freezer stuff. You know the items bought weeks ago that have migrated really far down to the bottom of the freezer. Yeah, those items. Time for them to come to the top and get ready for menu planning. I'm not going to buy any meat for at least two weeks. I don't know about you but I haven’t made any resolutions for 2013 because I really don’t stick to whatever plan I come up with. That in itself can feel disappointing. Lead a good life, appreciate what I have and love the people around me, that's essentially what I try to do every day anyway. So I'm going to go with that. What about you, dear reader? Have you made any resolutions, or any that you think you will be able to keep? One thing that I am going to do next year is to try some new recipes. This week I am going to make a dish from the Pioneer Woman's site for "Zannie's Black-Eyed Pea Dip". It looks delicious and a good way to start the New Year off with some good luck from eating the black-eyed peas. So, New Year's Eve is tonight and usually I would maybe have a visit from Granny New Years but, honestly, I have it all and don’t need anything else but love, good health and great friendships and the odd funny joke and a game to be played. C'mon Granny, bring me all that you can of that! Life is good. Happy New Year! Great buy on the groceries! Happy New Year! I plan on eating out of the freezer for awhile myself. 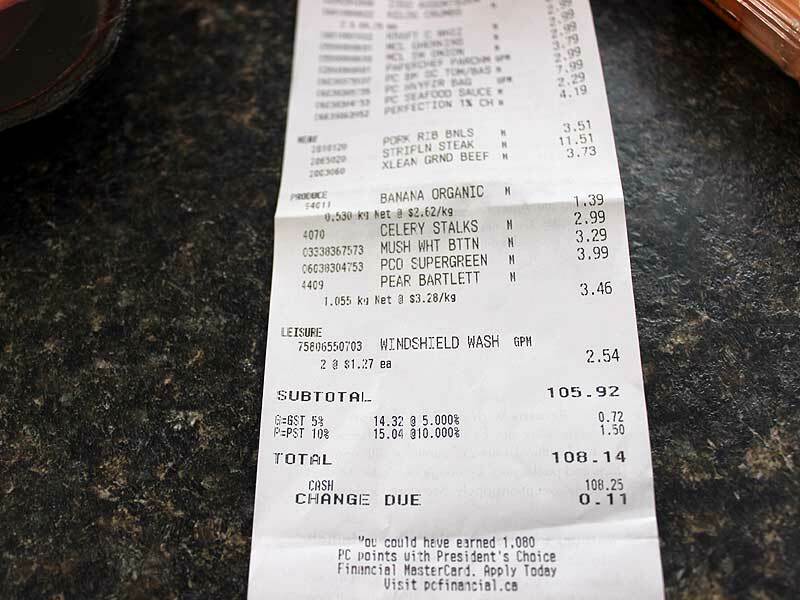 Like you, Himself and i splurged a bit on some really nice meals we could have at home. Happy New Year!! great deal at the shoppers, I tend to buy like that too when there are deals on but I'm always looking for airmiles too. Funny, we're the opposite regarding shopping in this house. I always do it after work and try to get it over with. Hate when hubby comes with me as he buys the oddest stuff and wanders around taking his time. Take a cooler with an ice pack the next time u want fish.I take 2 every time I head to the big city. Seems like a lot of us are doing the same thing - eating up the stuff that's been lurking in the depths of the freezer, pantry and cupboards. 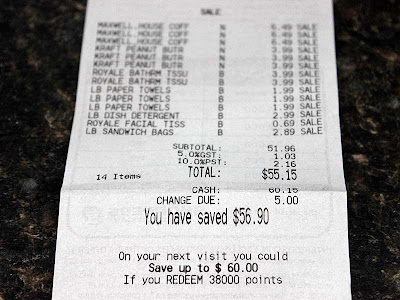 It's amazing how long you can go without shopping by just getting creative! I really need to check out Shoppers more often. It's only a block from my house!! Those sales you got are fantastic! Silly me! Happy New Year!! 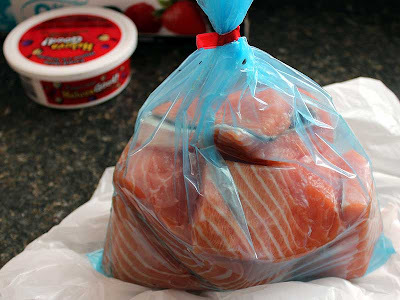 This is a great buy on groceries!